I’ve decided that it would be okay to use mattocks on (9), as it’s evidently a thick deposit and not at all rich in finds. By having dedicated shovellers, we can ensure that as many finds as possible are recovered. The main problem with mattocking is going to be the heat. Where Mick found the Romano-British pottery yesterday is clearly a separate context from either (9) or (10); it corresponds to the ‘tongue’ of (1) that was visible on the slope in damper conditions. We need to plan it and retrospectively remove this area from the plans of (9), (1) and (2). If the weather becomes damp tomorrow, as is threatened, we will be able to see this sort of thing and deal with it in the right sequence. We ought to have removed (10) by mid morning and we will need to plan the south-western end of the trench, as there are clearly new contexts showing up. In particular, the strip along the baulk to the south-west is very different in character from the material to its north-east and can be resolved into at least three separate contexts – one very compacted and chalky, one mostly of cobbles and the other with mostly weathered chalk. It is now evident that (11) is the fill of a small pit that cuts (5) to the north-east and (1)/(2) to the south-west. It appears to cut (3), judging from the plans, which at first sight raises questions about my interpretation of (3) as material relating to the ants’ nest; of course, the reason it appears to cut it is that there was no underlying chalk here for the ants to bring to the surface, so it is probably earlier than (3), although this cannot be demonstrated conclusively. 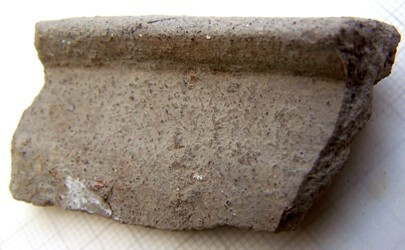 I wonder if the Romano-British material it contains derived from something under the floor of the barn. Mick suggests that it may be an animal burial: chatting to a local resident in the churchyard this morning, he found out that her parents buried their dog in Church Field many years ago. It is also likely that we will get an idea about how thick (9) is likely to be when he reaches the bottom of the feature. To the north-west, there is a much more chalky patch, that presumably links with the chalk in the north-western corner of the trench and that at the break of slope. This could be a separate threshing floor as it occupies the space between the opposing doors of the barn. Paul Palmer dropped in to site just before lunch and went off to The Three Horseshoes with Mick and Muriel. The chalkier material between the two barn doors is overlain by (12), a compacted soil that perhaps represents a build up on top of the floor that accumulated during use. This will come off quickly and the underlying chalk can then be planned and removed. Beneath that, the very decayed chalk visible on the south-eastern side of the trench is continuing (we can now see a section in the sides of the pit containing (11)) and will need a new number. Mick’s pit has proved not to contain an animal burial at all. Its purpose remains obscure and none of the finds from its single fill suggest any obvious uses. It is also apparent that it has not gone through the base of the material used to make up the barn floor, so the finds within it cannot derive from deposits beneath it. The north-eastern end of the pit is very undercut. 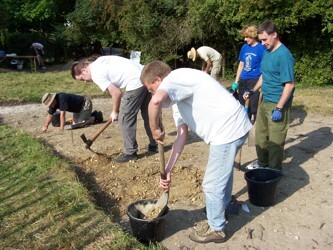 Posted on 11 August 2007, in Fieldwork, Norton Church Field Dig 2007. Bookmark the permalink. Leave a comment.